BOSTITCH C4R80BDG Thickcoat Round Head 1-1/2-Inch by .080-Inch by 15 Degree Ring Shank Coil Sliding Nail (4,200 per Box) by BOSTITCH at Sunny Doors. MPN: C4R80BDG. Hurry! Limited time offer. Offer valid only while supplies last. 2750-2020 Features: -Siding nails.-Ring shank.-Blunt diamond point style.-0.080 fastener shank diameter.-15 coil.-1-1/2''.-4,200 per box. 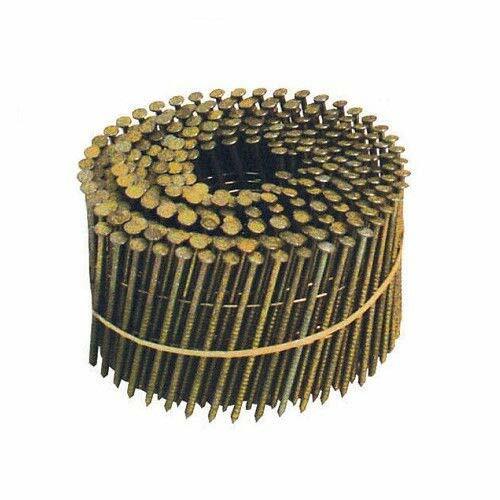 2750-2020 Features: -Siding nails.-Ring shank.-Blunt diamond point style.-0.080 fastener shank diameter.-15 coil.-1-1/2''.-4,200 per box. Color/Finish: -Thickcoat finish. Grip Rite Prime Guard MAXB64873 16-Gauge 304-Stainless Steel Straight Finish Nails in Belt Clip Box (Pack of 1000), 2"